Anil was in the Upper Sixth (Arts) Form of Royal College, Colombo, when I joined the class in January 1945. He was reading British History, Government and English Literature - if my memory is correct - whilst I was reading Latin, Greek and English Literature. I remember Anil as highly articulate - vociferous, even - and an ardent follower of the Political philosophy of Leon Trotsky who had been assassinated in Mexico in 1940 by a Stalinist agent. Anil was intensely interested in ending the exploitation of man-by-man, liberating the masses from the bonds of capitalism and improving the economy of this island. 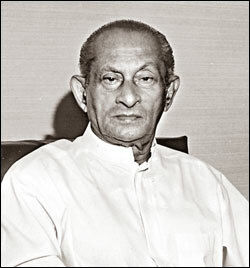 After leaving school in 1946, we lost touch with each other for some years, but I used to read about him in the newspapers and in 1970, when he became Ceylon Transport Board Chairman, which he managed in an exemplary fashion, I learnt that he was keen on assembling or manufacturing a basic utility automobile in this country. About the same time, I too was very keen on trying to interest some organization in assembling (what a view to future manufactured) the Citroen 2CV, a basic, but highly ingenious small car immensely popular with the less affluent in France. Since the car had been designed in 1935, I felt the manufacturing facilities available in Sri Lanka 35 years later would perhaps be adequate for the purpose. I put the idea to Anil at the CTB shortly after the 1971 JVP insurrection had been quelled and was delighted to find Anil highly enthusiastic about the idea. Accordingly, I got in touch with a merchant banker in London, Grahame Young, of Arbuthnot, Latham & Co., who arranged for me to visit the Citroen Company in Paris with him. Dr. N. M. Perera and T. B. Illangaratne, who gave us their blessings for the project. The Citroen representative, Jacques Eyraud, said that 60 per cent of the parts for the 2CV could be manufactured locally in year one and 97 per cent by year five. He came to this conclusion after visiting the CTB’s Werahera workshops and the Lanka Leyland factory premises near Homagama. He said Citroens would supply any parts that could not be turned out locally. Eyraud, having seen some 2 CV chassis already fabricated at Werahera out of mild steel sheet at Anil’s initiative and being highly impressed with the workmanship of those as well as the castings produced there of gear box housings, on Anil’s orders, said that the way to go would be to order six brand new 2 CV’s from Paris (the FOB price at that time was - believe it or not - about Rs. 7500 each!) and assign a team of ten mechanics to each car, to dismantle it to the last bolt and nut and then reassemble the parts to make up the complete car. This was to be done ten times by each team, so as to thoroughly familiarize themselves with each component. Anil (whom, incidentally, Grahame Young described to me as a great patriot after conversations with him) approved of Eyraud’s suggestion. Anil, therefore, as Head of a Government Corporation - the CTB - had to apply to a functionary designated Public Corporations Director for permission to order the six 2CV cars, which Anil duly did. That functionary, incidentally, was an ardent Trotskite intellectual himself, but more an aesthete than a practical man. Months passed and no reply had been received by Anil to his application. Thus was sabotaged Anil’s dream of manufacturing a utility vehicle in this country. Such an industry would have given rise to a large number of small-scale component manufacturers, cottage industries in effect. In ‘developed countries, automobile manufacturers accounted for about 8 per cent of a country’s GDP at that time. Indonesia, Thailand and Malaysia have thriving automobile industries which were set up in the 1980’s, but Sri Lanka would have had a head-start, if not for the lack of understanding on the part of a government bureaucrat.